As you know, Microsoft acquired Minecraft and made the announcement in December of 2015. This past week, Microsoft announced the acquisition of MinecraftEDU. They have rebranded it and it is now called Minecraft Education Edition (MinecraftEE). For many of us in education that have invested in MinecraftEDU it begs the question, what now? During the annual bett http://www.bettshow.com/ conference in the UK, Microsoft had a large booth set up and opportunities for people to explore MinecraftEE due out this summer worldwide. Sessions were offered and mentors were available to assist teachers and administrators alike in previewing the new version. I followed the http://www.bettshow.com/ conference on Twitter and had an opportunity to ask a couple questions of key people at Microsoft. My first big question was what programming language is the new version of MinecraftEDU built on. MinecraftEE is built on C++. The current version of Minecraft and Minecraft EDU are both created in JAVA. What does this mean for education? 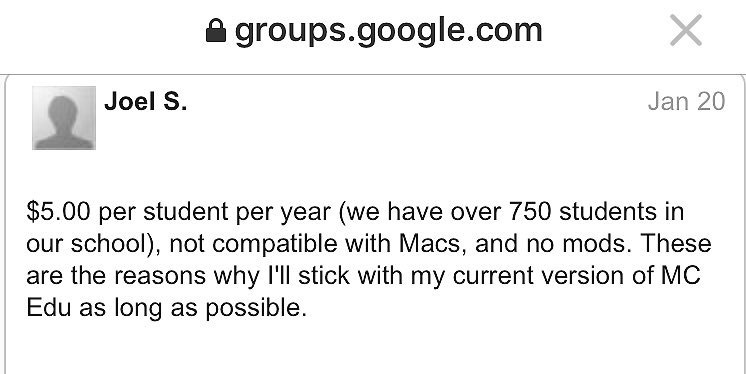 C++ will be less of a beast to manage in IT departments. It still has yet to work on a Chromebook, but will work on tablets like the current PE (Pocket Edition) does. With the new platform, there will be increased functionality and a new interface that will allow for personalization and student profiles. 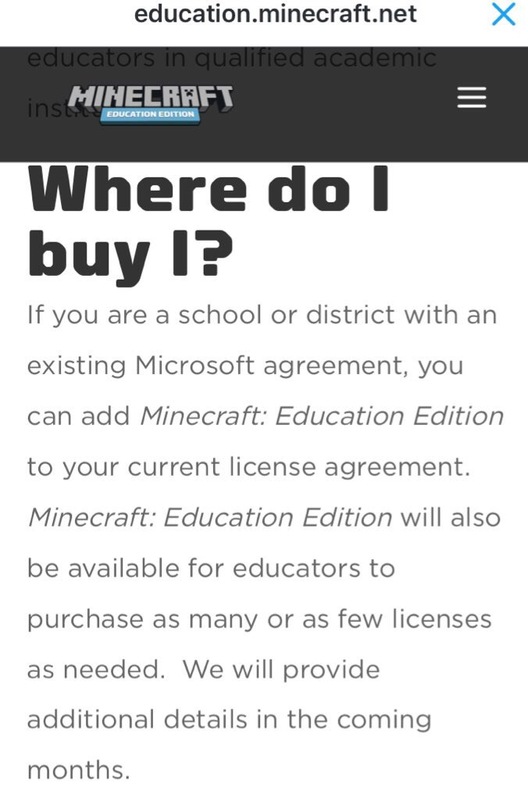 In the current version of MinecraftEDU, I can buy a license for $14. That license can be installed on the computer and have as many users as I would like to have rotate through that environment. The + for that is budget. The – is that students cannot save their local projects very easily due to a lack of a unique signin. In the new version of MinecraftEDU, I will spend five dollars per student annually. This new pricing structure, will be difficult for many districts if they want a districtwide utilization of this new tool. Students will login with the unique identifier and be able to keep all of their work under that credential. It will be interesting to see if this tool will work in a pure web-based interface or if there will be a need for a client install. We will know more on this topic. In the coming months. In the current version of MinecraftEDU, users can create custom mods that essentially modify the game. That part of Minecraft & MinecraftEDU has had great appeal with users as it feels very much like an open source community based application. In the new version of MinecraftEDU, mods are not currently available. We will have to see once the platform is released how much control users will have at the code level. Can they modify the code and reimport like they can now? Will there be as much sharing in the Minecraft community that we currently see where there is no limits to the users creativity? Many programmers will tell you that C++ is a far more reliable platform then JAVA. From a programming perspective and a user experience perspective, this may be an advantage. We will no once we have a chance to experience the new version. 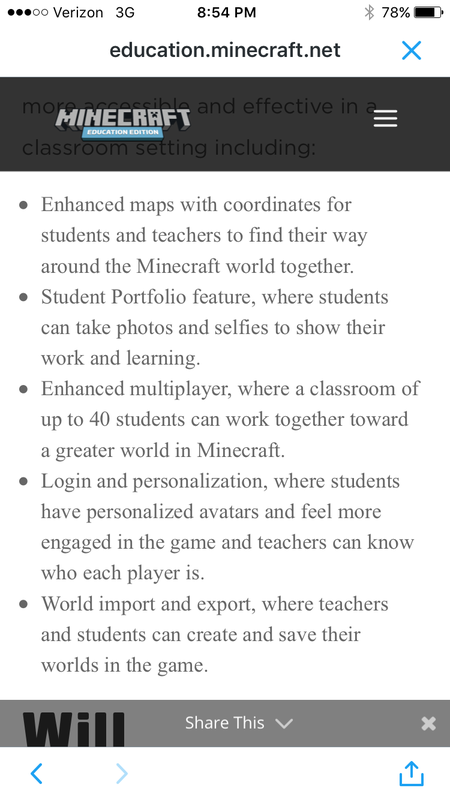 For classrooms, schools, and districts that are considering MinecraftEE need to weigh the pros and cons for the budget, the ease of use, and a comparison of the functionality prior to making a decision. In my district, I have essentially 100 licenses of the current version. Beginning this summer, Minecraft EE will be available to my district for free for one year. My strategy is to continue to use the current version (MinecraftEDU), and compare it to the new version (MinecraftEE) prior to making the budget decision to move all students to the more expensive version of MinecraftEDU. I feel confident within a year our students will tell us which platform they prefer. The Microsoft version of MinecraftEDU is going to be a more expensive deployment then the current version of MinecraftEDU. Budget will not be my main data factor, but it should be yours if you are brand new to the tool and considering the deployment in the next year. Check back for updates as the story unfolds. In the meantime, happy world building in Minecraft EDU.